The Intergalactic Starship Albatross, with Captain Tempest at its helm, is on a standard interplanetary scientific survey mission, when it is pulled onto a planet not even marked on their cosmic charts. Here they find Doctor Prospero and his daughter Miranda, and discover Prospero’s secret formula for telegenesis, a dangerous invention that aims to be able to create matter from brain power alone. So ensues a cult tale of love, trickery, deception and monsters. The musical by Bob Carlton, which won the 1990 Olivier Award for Best New Musical, is a well crafted mixture of fifties and sixties pop anthems and Shakespearean text. The musical is loosely based on the 1950s film ‘Forbidden Planet’, which was based on Shakespeare’s ‘The Tempest’ but the piece borrows lines from across Shakespeare’s oeuvre: “Two beeps or not two beeps, that is the question” was a particular favourite with the audience. The word play is intelligent and witty, and we don’t lose a syllable of it thanks to the cast’s clear and lively delivery. The actor-musician cast is consistently strong all round, deftly switching from vocals to saxophones and trumpets, led by musical director Rhiannon Hopkins. Simon Oskarsson’s fantastic robot on roller skates Ariel, is the standout performance of the production, a detailed and committed characterisation full of energy, playfulness and wit. The evil Gloria played by Ellie Ann Lowe is also particularly strong – slick, fierce and effortless, something which other members of the cast could learn from as there are a few too many moments where it is clear how hard this cast are working. Certainly playing instruments, singing, dancing and acting is no easy feat, but the cast need to make it look easy, something I’m sure they will achieve as they settle into the run. In fact there isn’t a weak link across the cast in terms of talent, though at times certain performances could be a little more streamlined, the brilliant energy levels just a little more focused. A few things need ironing out – there’s the odd technical issue and clumsy musical moment but the audience is so onside that these moments are utterly forgivable. 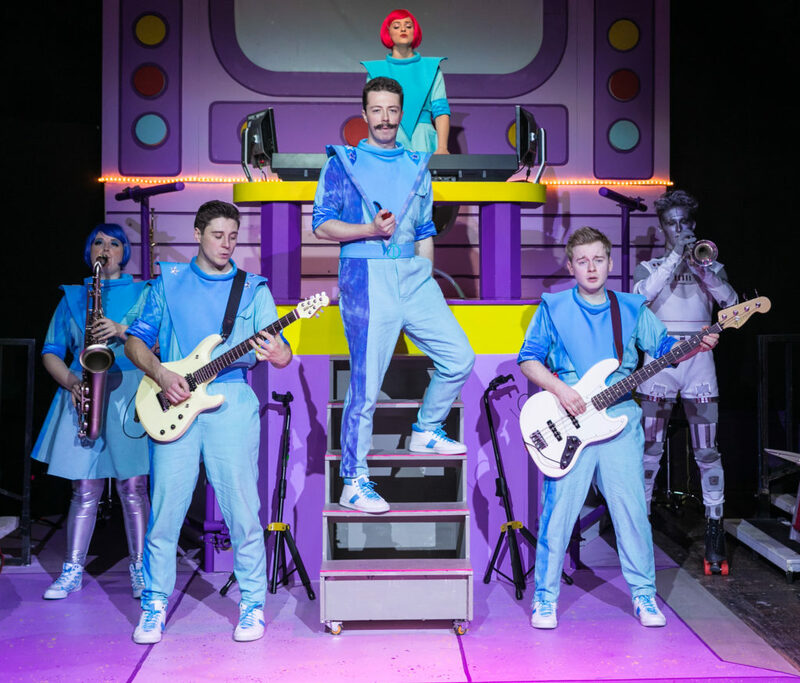 The production is brimming with wit and silliness, no desire to take itself too seriously, something which is echoed in the design – neon blue space suits and yellow and purple set designed by Amy Yardley. This production is undeniably great fun, supported by consistently strong performances, and you will be sure to leave with a smile on your face.